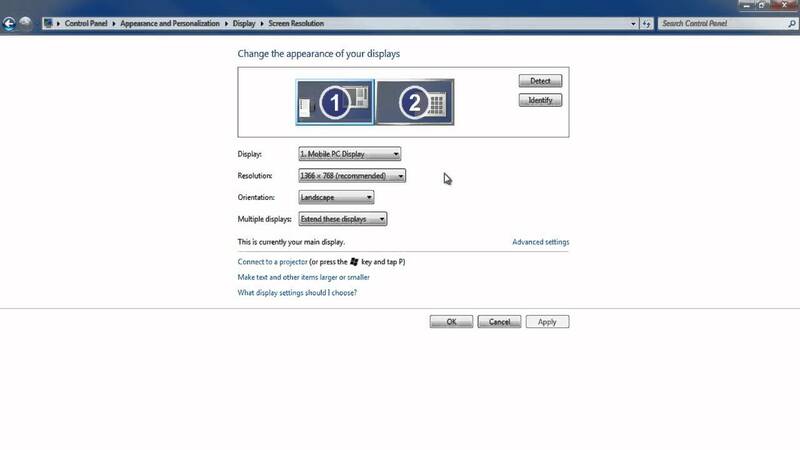 Then selected hdmi 2 on the TV remote, got a blank screen then went onto the lappy , went into control panel, got this after hitting "change display settings"
So tried the only available option on "the left "connect to a projector"
I go to the 'number keypads' on my lappy and around F10 [will vary depending on make of laptop] i can change from laptop screen only...laptop & tv ...tv only Hold down the FN button while you press the F10,or whatever button has the 2 screen logo on it. Ted, it is not seeing your HDMI as it should show 2 screens not one. Is your HDMI cable working okay? Possibly try on a friends setup or borrow a friends cable. Ted, if you connect your lead as before and then click on "detect" it should pick up your telly. Have you tried all the HDMI channels. I could do it with a android tablet to HDMi on TV socket .But it won't let me do a sky transfer as sky don't support HDMI. Was ok on i player.